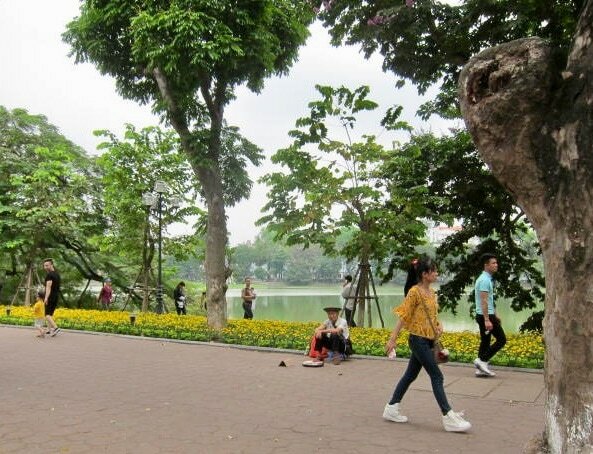 The heart and soul of Hanoi is Hoan Kiem Lake. The walkway around it is almost always crowded as families and tourists take the stroll. It is crowded but not on weekends because the downtown park is suddenly massively expanded by a closing of the roads to vehicles and the opening of the center to the people that lived in the city. ​Watch this video to see the fun people have. A walk on Saturday or Sunday morning is a fantastic experience. Tiny children stand on the curbs looking suspicious at the empty roads. All of their experience that any tippy toe out into that black surface will have a grandma or grandpa howling in rage in the ludicrous race of the aged minder and the terrified miniature Vietnamese. These tiny children look around, find the assigned grandparent chatting with old friends, and cautiously stick a toe beyond the forbidden boundary. No howl rises, they take a second step the vast block runway of pavement stretches out and with a burst of speed the little guys break out in squeals of joy, freedom, and the sudden realization that they own the streets. ​It's a rediscovery of what a great city should be. Going far beyond monuments to dead heroes and badly remembered wars, the open celebration of space and the obvious joy of the families freed from tiny alleys to the great outdoors are evidence to the wisdom of this decision. The air is breathable. The vendors are out with plastic toys and bubble wands. Effusive parents catch the spirit and buy every childhood knick knack that on a weekday will be spurned as waste. 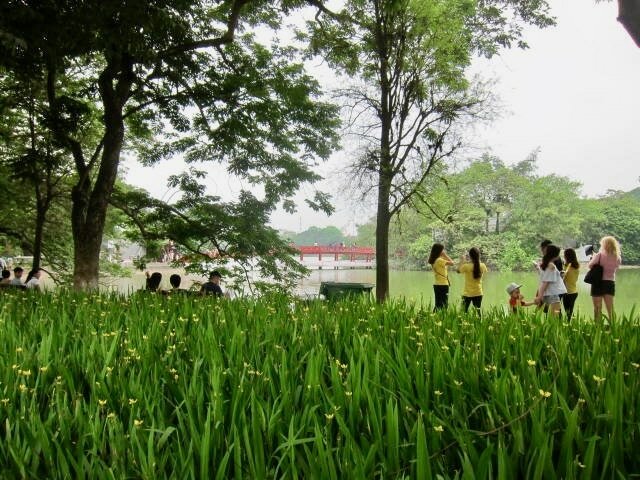 ​​​The flowers around the lake are a perfect backdrop to the play of children and the pop up musical groups with mixed instruments playing amazing mixes of western music and oriental overtones. Red river valley means one thing in Winnipeg but has a whole different meaning on the banks of the red river in Vietnam. 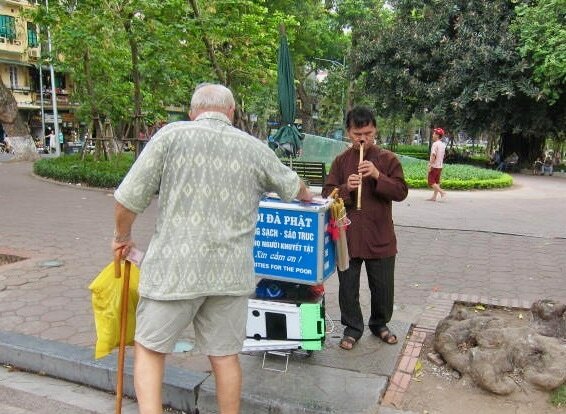 The blind nose flute player Yankees in one corner playing a melody that draws you over towards him and his charity box. Street food is always magical in Asian cities and a ban mi in this new downtown weekends only pop up park maybe the greatest sandwich in the world. Everyone smiling, everyone is happy and after 3 hours of wondering, our cheap muscles are overwhelmed and we limp home for a complete facial rest. 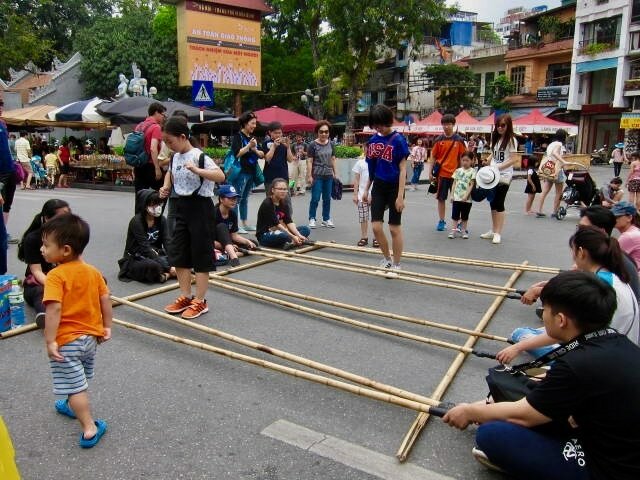 Hanoi has always been a great city. This new park in its heart has made its weekends absolutely magical.